The Fujifilm XF 10-24mm f/4 R OIS is an ultra-wide angle zoom lens designed for the Fuji XF APS-C camera system. I think that Fujifilm’s zoom lenses are somewhat underrated among photographers. Prime lenses are very appealing in the Fuji system because they have excellent optics and they are affordable. This was my preference when I got into the system. I originally bought this lens because it goes down to 10mm. The widest prime Fuji makes is the XF 14mm f/2.8 R so I bought this lens to use as an ultra wide. More recently, Fujifilm has announced the “Red Badge” 8-16mm f/2.8 R LM WR. I will review this lens as well when I can get a copy. But surprisingly, I fell in love with the 10-24mm f/4. The optics are on par with all of the prime lenses. Sure its doesn’t open to f/1.4 or even f/2.8 but it does have built in optical image stabilization which gets you some wiggle room with longer shutter speeds. I really love that I can just pop this lens on a body and I’ve got a really nice and versatile setup that covers everything from landscapes to street photography extremely well. The Fujifilm 10-24mm f/4 is designed with 14 elements in 10 groups. There are 4 aspherical and 3 ED elements. Optically this lens is on par with the best lenses Fujifilm produces. You get the pseudo-macro focusing and separation with the minimum 9.4 inch focusing distance. Its sharp – even at wide apertures. The bokeh is beautifully rendered. Color rendition is excellent and there are no noticeable issues with vignetting or light fall-off. One thing that Fujifilm does impressivley well is that they are extremely consistent with their lens design. Its an APS-C system and they have a lot of “corrections” that are done in camera. However I don’t really have a problem with this. These lenses are only going to be used with the X series of cameras. There is definitely a “fuji look” and this lens has all of those characteristics. The Fujifilm XF 10-24mm f/4 has built-in, optical image stabilization. This is very nice to have considering the widest aperture you get is f/4. In low light you’re going to have to go with longer shutter speeds so hand-holding does become an issue if you want to keep things sharp. This is, however one area that I would really like to see Fujifilm develop moving forward. Olympus and Panasonic have much superior stabilization in their cameras. Ultimately you want to have a combination of in-body image stabilization and optical stabilization in the lens. The optical stabilization on this lens is nice, but its just not on the level that you get from other camera systems. This problem is across the Fujifilm lineup. Its not a deal breaker, but you will have to learn how to work with low light if you’re shooting hand-held. Fujifilm use an internal stepping motor for autofocus. Despite being an older design, it is implemented extremely well in this lens. Focusing is fast and quiet – you can even use it for video. Fujifilm use stepping motors across the lens lineup for autofocus. They are not all implemented equally. Some are slow and clunky, but the design here is excellent. There are three collars on the Fujifilm XF 10-24mm f/4. You can control focus (when in manual focus), zoom of the lens and there is also an aperture collar. The Fujifilm XF 10-24mm f/4 is a heavy lens. Its not as heavy as a DSLR equivallent, so remember this is relative. If you use Fuji cameras though you will notice it to be much larger than what you’re used to. Its also a bit front-heavy. I wouldn’t say this is a con for the lens, just note that if you get it its going to feel a bit different. 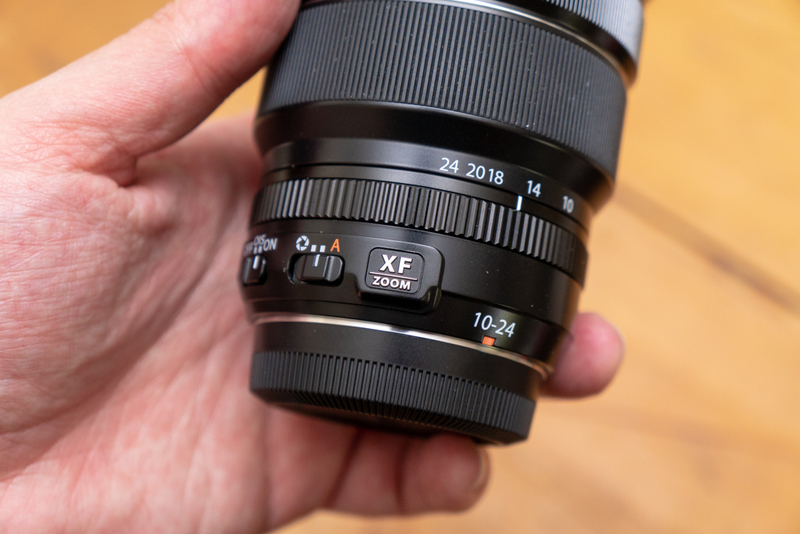 The Fujifilm XF 10-24mm f/4 features an aperture collar combined with an activation switch which is a little different than the way the prime lenses are designed. Most of the Fujifilm prime lenses feature an “always active” aperture collar that simple has an “A” setting on the far left. This lens works a little differently. I actually prefer this as there are many times where I accidentally knock the “A” setting over to f/16 on a prime lens and not realize it. There aren’t very many to be honest. This isn’t a cheap zoom lens, but its also not prohibitively expensive. When you consider the versitility that you’re going to get with this lens, its quite affordable. The lens is also bulkier and heavier than the Fujifilm primes. Not a deal breaker for me, but compact camera design is what draws many people to the Fujfilm XF system. Physics are physics and this lens is a consistent f/4 aperture across the zoom range. Its going to be a bigger lens. 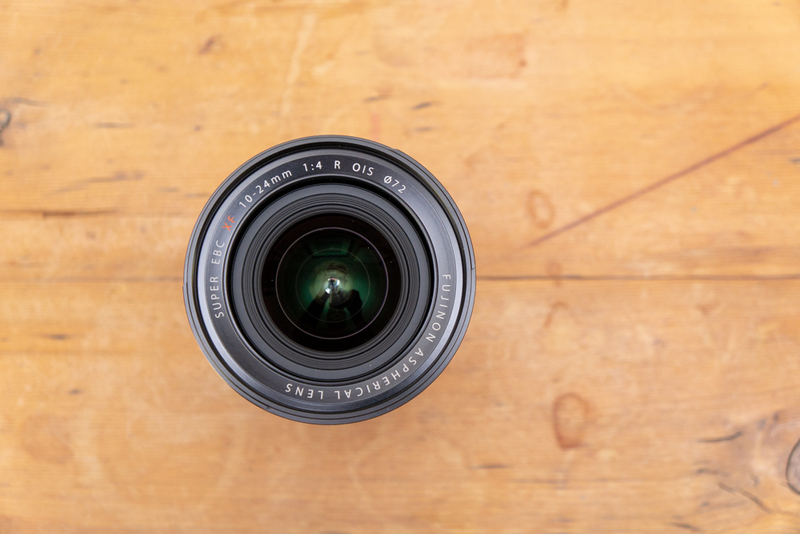 If you have a Fujifilm XF camera – get this lens. For sharp landscapes or interiors its absolutely essential. While you don’t quite get the depth of field of say, the 16mm f/1.4, you still get some depth of field. Sharpness and rendition are the key features of this lens and it delivers. Highly recommended.